I don’t have much of personal info in the About page and figured this might be a good time to share some with you. I chose to do a 31 random things about me as I am stepping into my 31st year today, the 31st.. And it turned out to be the hardest one to write. I live in East Lansing, Michigan in the U.S. with my loving wife Priya. Go Spartans! I have a little brother & a sister living in Chennai. My parents live in Chennai too in the house I grew up. Our house is less than a mile from the airport and grew up watching airplanes flying in and out of the airport from our terrace. Our current house in E.Lansing is 5 miles from the airport and I still love to watch the airplanes fly in and out from our deck in summer nights. I can’t ski but enjoy long walks with my wife. I love playing pool even though I am not good at it. I play in a BCA 8-ball pool league (in my 7th season). I love playing volleyball – I am in a long break since Sep after an ankle sprain. I drive a Mitsubishi Eclipse – always wanted a sports car! I enjoy bowling. I once scored 222 on a Thanksgiving day just to see my buddy score 223. I never played any kind of sport for the best part of my life. I like cooking but hate cleaning up after. I enjoy fiction – Irving Wallace, Ken Follett, Robert Ludlum, Michael Crichton kind of books and an occasional book like ‘The World is Flat’. I can’t swim well but love to be in the water. I am very bad at returning phone calls. Friend, if you haven’t heard from me just know it’s not personal. I’m just lazy at that. I love nature and Grand Canyon has to be the best place I have been to. 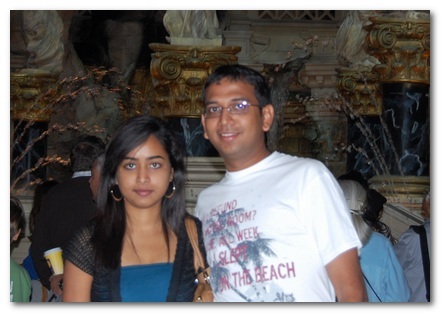 I registered ShanKrila.com in Sep 2006 in hopes of creating our family website with pictures & such. ShanKri-la is a play on the word – Shangri-la. shan being a part of my wife’s name and the K, is of course me. I love movies – comedy, mystery, drama & action. For a geek, I really don’t enjoy Sci-fi as much. Recent favorite – Charlie Wilson’s War. All time favorite – Forrest Gump. Favorite actors – Rajnikanth (tamil), Tom Hanks, Will Smith & Adam Sandler. Favorite actresses – Asin (tamil), Catherine Zeta Jones & Julia Roberts. I am running out of things to write. My favorite cuisine – Indian (surprise! ), Mexican, Thai & Italian. If this hasn’t put you to sleep, I don’t know what will. Thanks for sticking along with me and you are the reason I am blogging. Happy Birthday, Karthik! I just stumbled here courtesy of BloggingGal! And while this post was a personal one, rather than a tech-help one, I found it quite entertaining. Especially since my high score in bowling was a painful 199. I guess getting an awesome score above 200 only to be beaten by 1 point is just as painful. patrick’s last blog post..Add The Contacts App to Your iPhone Home Screen!!! Andrew, thank you for your birthday wish and welcome to ShanKri-la! Almost for a year, I have been kinding of hiding behind my nickname with my readers and except for a few friends here, most of my readers knew little about me. I figured this would be a good opportunity to stray away from tech stuff. That’s awesome that you love Indian food. May be you might find something you could make yourself from one of my wife’s recipes. (she loves it when I plug her blog here 😉 ) And she likes coupons and deals too. I will have to ask her to check out your blog. Looking forward to seeing you around too. Cheers and have a great day! Thanks Shankar! Haven’t I mentioned that to you yet? Gosh! Born and raised in Chennai until I moved to the US in 1999. Patrick, great to see you here man! Thanks a lot for the wishes. It’s great to hear that Indian food is so liked around the world. Of course, it is pretty big in the UK. Instead of plugging my wife’s blog in every comment, I went back and edited the post to add the link right there. I can now get one big brownie point! 😆 Cheers and thanks again! Oh my gosh……. Of all the people..i could never imagine karthikeyan writing a tech blog… looks cool anyway.. keep up the good work.. Happy Birthday man! I’m about to join that 30 club. I really enjoyed that post, except of course that stuff about the Spartans. Mitsubishi Eclipse is a great choice! Kyle Eslick’s last blog post..Blogging Discussion: How Often Should You Post? Happy Birthday buddy. Good to know so much about you and see your pic. Kyle. thanks buddy! It doesn’t feel as aweful as some people say! I’ll see you soon here. 😆 Great to hear you enjoyed it.. and yes I love my car. Madhur, thanks a lot buddy! I was hoping atleast some of you would like to see this and I am glad to see I was right. Tish’s last blog post..ShanKri-la – Where Technology Meets Daily Life! Happy birthday K! It’s nice to see when bloggers add a little human interest to their writing, and this is a great time to do it. Like many others here I am a lover of Indian food but I had no idea your wife had a blog. I’ll have to check it out! Tish.. thanks again! That picture was taken at Caesar’s Palace in Vegas. Troy.. thanks man! I was surprised at the number of people who found this interesting. I almost scrapped the idea but figured if i didn’t do it now I’d never do it. 😉 She just started her blog a couple of months back and she has gained almost the same traffic as this blog! Go figure. 😆 In fact, this is the first time I have mentioned it here besides having her in the blogroll. Hope you find some food you like over there. Oops, I missed the birthday…so happy belated birthday, buddy! Almost 2 months late, but Happy Birthday! It’s great to find out a little more information about you. I have a question: Where would go if you won the lottery? I love travel too and I think about this from time to time, but I keep changing where I’d like to go!